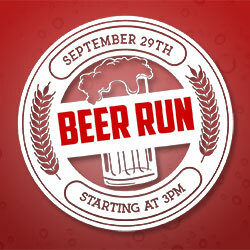 The Beer Run is back! September 29th, 2018 starting at 3pm. A 3-mile course along Evansville’s West Franklin Street. Walkers and bike riders welcome too. This is not a timed event. 6 Beers, 6 Bars, and a freakin T-shirt – just $25! Limited to the first 400 to register! There will be NO REFUNDS for those that can’t attend. However, you may give your receipt to a friend/family that can attend in your spot. They MUST have your registration receipt. Packet pickup begins at 1:30pm on Sept 29th. The packet will have your t-shirt, map, and armband. You MUST pick up your own packet, as each participant must present a valid ID. Your ID may be required at each location – please keep it with you at all times. On race day, Lamasco is beginning and ending destination. Parking is available to the west in the Case Engineering lot, to the east in the union hall lot, and to the south in the Old Antique Mall (about 2 blocks up 6th towards the Lloyd Expressway). And of course, tons of off-street parking. Participant wristbands will be issued. Due to the smaller beers needing to be ordered at each location, each bar will only have the amount to make sure each runner gets ONE beer at EACH location.